Quake 2 grew on me very rapidly. And, just like before, I got to work copying parts of it and also trying to change bits. The first level was freely downloadable in source form, so I started editing that and working out how all the fun stuff was done, like transparent water and coloured lighting. Once those basics were covered, I started trying to copy more complicated parts of levels, the whole time building a better understanding in my head about why the levels were built and stylised in the way they were. For the longest time I was stuck making maps in the ‘base’ style, although I dabbled with the other themes occasionally too (brown was the colour of choice back then.) 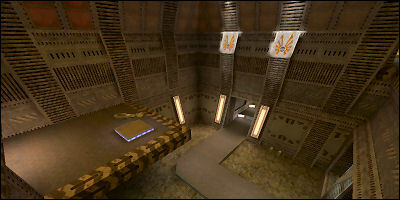 Like Quake, I ended up with hundreds of half-finished maps and half-executed ideas, but in the process had developed a taste for the designs and themes, and worked out what worked and what didn’t. The moral so far: copying for your own education is good. 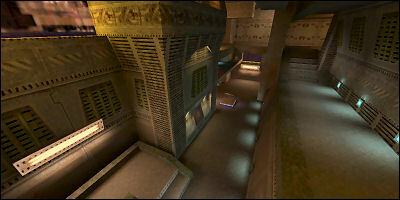 Most of my days with Quake 2 were spent looking at not only the original maps, but the additional ones made in the community. Some are absolutely beautiful. I tried copying their styles too. Then Half-Life came out. I immediately jumped onto the bandwagon. I started making ETC within a few weeks. However, it wasn’t the end of me playing with Quake 2. 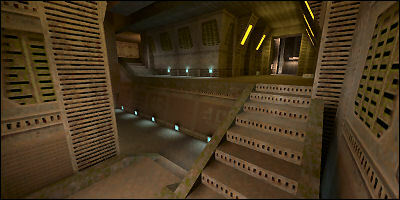 Whenever I got to a dead-end in ETC, I went back to Quake 2, and continued work on a map I had started a bit before, ‘djdm1’ aka ‘Evenings’. Evenings was, in retrospect, a pretty bad map. A maze of a place, with some very hacked-together areas and no overall structure. 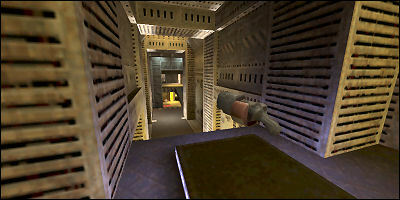 Much of the item placement was directly influenced by other maps. The area in the above screenshot was one of my favourite bits. I remember thinking how clever it was - a platform that you had to drop onto, in order to reach health! Amazing. The above screenshot shows one of the most hacked together pieces. It was really just a hub for three or four tunnels which had to meet somewhere. Getting the brushwork to fit and look half-good took a lot of work and aggrevation, and eventually I admitted defeat. That was a lesson learnt. Evenings was uploaded to cdrom.com on May 1st, 1999, making it my second-ever released map. According to the text file, it took 5 days to make. That can’t be right. Of course, after that, things got a bit boring. First came ETC. Then I made War Torn Retirement Home (cs_tire). Then, my fifth map… Dust. I started editing maps when I was 11. I was 16 when I released ETC and Dust. Today, I’m 22. That’s half of my life making maps already!